My little boy turned one back in June. Oddly, I feel sad about this. I’m feeling similarly melancholy as my five year old gears up for kindergarten this fall. I suppose I’m being a bit melodramatic about it all, but I’m mourning the loss of their babyhood. Every day they seem older and more independent. I don’t regret this at night when I get more than two hours of sleep in a row, but I miss lots of little things: the newborn smell (which is really the odor of spitup, if I’m honest), the feel of a sleeping baby against my chest, nursing before bedtime. I brush my finger along chunky baby thighs and cheeks and sigh, knowing they won’t be like that forever. Despite this, I am truly enjoying watching this little one grow. He’s just started walking and his drunken stagger never fails to amuse. His loud questioning grunts and exclamations sound like real conversation, even if unintelligible. This boy was a champion nurser from day one, but eating has been a different story. He loves peanut butter (the Adams Peanut Butter jar sends him into ecstatics), but not a whole lot else. At least not consistently. So when it came to making him a birthday cake, I thought I would honor his love of PB. 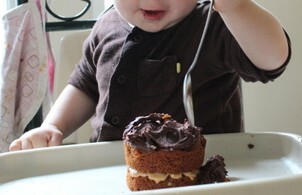 I also have a hard time making a real cake for such a small child; they just seem too young for all that sugar. When I first started this children’s birthday’s business, this resulted in some pretty nasty, last-minute adaptations. (Luckily my daughter was too young to remember some of these fiascos.) Not this year. 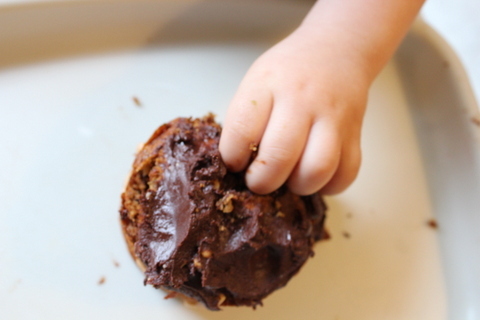 I’ve been making some drop-dead delicious and super healthy banana muffins lately, and I had a flash of inspiration as I pondered baby boy’s first birthday treat. (And since I only had a few minutes to ponder, this fast and familiar recipe sounded good to me.) Plus, I’ve always loved the combination of peanut butter and bananas, so I thought with a little chocolate-peanut butter “frosting,” this would be the perfect thing. I love this recipe! I came across it a few months ago, amongst the stack of banana bread recipes I’ve collected over the years. This one I clipped from a magazine (UT Health) that I wrote an article for about 7 years ago. I never made the bread, just squirreled away the recipe for future use. In any case, I finally tested it out this Spring, with a few alterations, of course), and was pleasantly surprised. It’s my favorite healthy banana recipe to date. 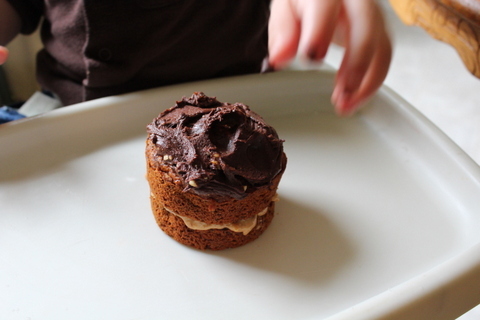 You can make this in a loaf pan (as the original recipe directs) or as muffins, but I love my mini cakes version below. It’s great plain, but I do think it’s best with the chocolate-peanut butter frosting I’ve added. You could add chocolate chips and real chocolate frosting for a more decadent dessert. 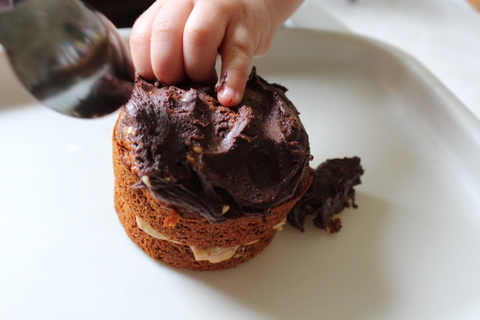 I’m realizing now not everyone will find their mouth watering at the sight of a toddler’s fist mashing up cake, but I was more focused on him than the cake. What’s your favorite children’s birthday dessert? I’m always looking for ideas, especially semi-healthy ones. Special Diets & Allergies: Vegan (if you use agave instead of honey), vegetarian, dairy free, soy free, nut free (if you leave off the frosting or use a different type). These moist and sweet mini cakes are delectable. The cake is light, despite the whole wheat, with hints of honey. 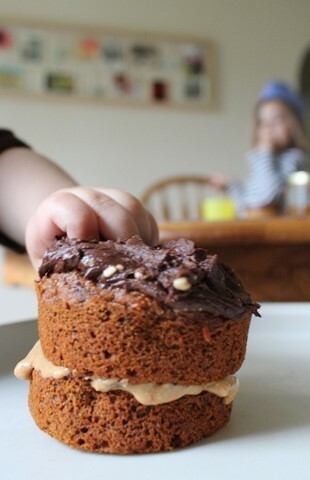 Paired with Chocolate-Peanut Butter frosting (recipe below), these little cakes become a festive treat without the usual sugar overload. This recipe makes 4 double-layer cakes, which really ought to be served whole as single-servings, for appearance’s sake, but be forewarned: one double-layer cake is a very large serving. Make sure you use extra ripe bananas here (think dark brown), as the recipe relies almost entirely on the fruit for its sweetness. Preheat the oven to 350 degrees. Grease eight 4-oz. ramekins. Mash the bananas and mix with the honey, applesauce, oil, and vanilla. In a separate bowl, combine the flour, baking soda, and salt. Stir into the banana mixture. Spoon the batter into the ramekins. Bake for 30 to 35 minutes, until the center is set. Let cool in the ramekins for ten minutes. Then remove and cool on racks until completely cool. If the tops of the cakes are highly rounded, slice off the top of four of the cakes to flatten them, just as you would for a large, double-layer cake. Frost the top of these four baby cakes with chocolate-peanut butter frosting (below). Place another cake on top of each of the frosted ones, then frost the top layer of each double-layer cake. This slightly salty, slightly chocolatey spread is similar to Nutella, without the hydrogenated oils. It’s fast and simple, and kids love it. Try it on top of all sorts of fruits and bread products to turn a snack into a “dessert.” You can make this much more sweet and chocolatey simply by upping the amount of chocolate chips. Play around with the amounts—it’s hard to mess this up. Just keep an eye on it in the microwave. Over cooking it will result in a dried-out, chalky spread. You can use this as a frosting-type spread, as directed below, or use it hot as more of a glaze. My favorite is spooning it over slices of fruit, like bananas and strawberries. Place the peanut butter in a microwave safe bowl. Pour the chocolate chips on top. Place in a microwave and cook for 15 seconds. Stir. Repeat, stirring every 15 seconds, until the chocolate chips are completely melted and incorporated into the peanut butter. Let cool for a minute, then spread on cake or almost anything else. This will store in the fridge, but let it come to room temperature before trying to spread it as frosting. I think I substituted applesauce, bananas or pureed dates or prunes for half the maple syrup sometimes. Thanks for the recipe! This looks like a fun one. I am definitely going to try it. Is the couscous crunchy? Rosalie! I lost your blog for awhile but now it is found! These muffins/cakes look great!! Great idea for the frosting. I can’t believe the little guy is ONE! Yikes. So good to read your “voice”!